Ladies, as the eagle soars to the heights, the goats in Glacier National Park climbed way beyond my expectation. In fact, you’d have to be an eagle to get up close and personal. God certainly designed the goat for the high mountains. I’m intrigued with the unique role of the goat in the Old Testament world. The goat was part of the routine sacrificial system designated by the Lord (Leviticus 1-4). And on the day of Atonement one of the goats, chosen by lot, became the scapegoat. The Jewish High Priest would confess all the sins of the people over its head and then send it into the desert, taking their sins away with it (Leviticus 16:8-10). In the New Testament it is clear that it is impossible for the blood of bulls and goats to take away sins (Hebrews10:4). Jesus instead took on all of our sins: he entered the Most Holy Place once and for all by his own blood, having obtained eternal redemption (Hebrews 9:12). Ah, so we spiritually have no further use for the goat. But the psalmist said, the high mountains belong to the wild goats. And that is where they love to climb. At the Goat Lick turnoff in Glacier, one can catch sight of any number of these magnificent beasts. We watched as a mother and baby scampered over the vertical cliff, stopping occasionally to lick away at the rich mineral rock. It is presumed that, over the winter, calcium and other mineral salts have been depleted from their bones. Pretty curious, how they knew this rock wall was the one to lick on. Could it be a God thing? Around the bend there was a herd of maybe fifty, snowy white, content on the side of a great hill. If you get up close with your telephoto lens, you can see the smile on their faces. 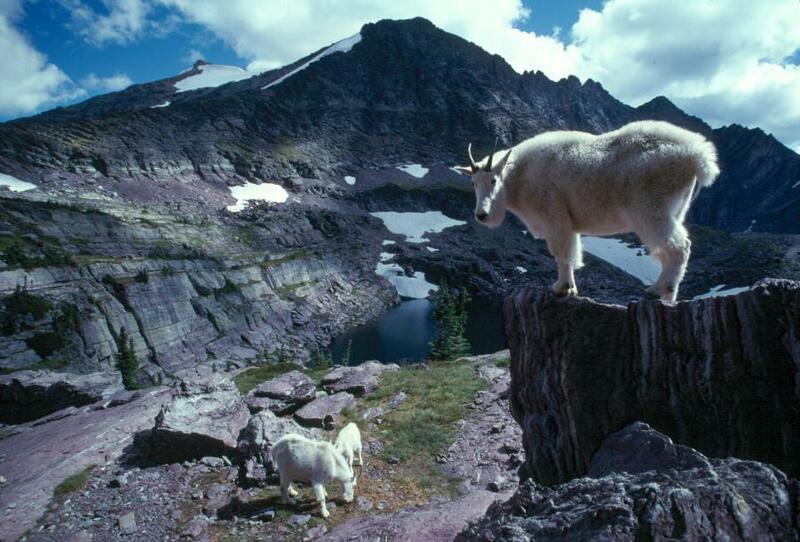 Yes, the high mountains do belong to the wild goat. And we belong to our God. There are high places we can symbolically climb to catch the nutrients we need from a time with Him. Father, what an enricher You are. You know what we need and where we can find it, all at the right time.